Photo: Water and WiFi what more do you need? The help yourself table loaded with toilet paper, drinking water, hot water, coffee, tea and bananas gives guests a clue to how thoughtful and attentive the family who run Joli Guesthouse are. Unsurprising, the rooms in the four-storey building are spotless and exceptionally tidy. It’s by no means luxurious, yet it’s everything a backpacker or flashpacker could want within a room of fresh white walls and clean tile floors. There’s air-con, WiFi, a bed topped with white cotton linens, table and chair, medium-sized fridge and bright hot water bathroom. The family is friendly and eager to help making this one of the top picks for budget travellers whose main concern is clean, comfortable rooms and a location in the city centre. 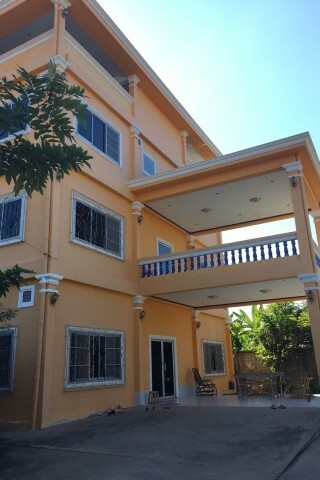 You’ll find Joli Guesthouse down a lane off the road between the 7-eleven and Dao Cafe.